Generally an interviewer asks this question at the end of the interview. This question is an open ended question and can help you in making a lasting impact if you have been very attentive during the interview or have done a good research about the company & your role’s background. You can book your seat at that company with a great, well crafted answer. Saying, “No, I don’t have any question as of now” might not go very well with the interviewer’s mind. If you already had a great interview process till this point then the answer might not matter much else it might be a critical blow to your selection chances. The simplest question can be related to the kind of work company is in to or something which they might have on the cards for future. It’s good to go through the company’s website, related news articles or some manual which the company might have shared during the placement process. Keep a track of what all have been asked and what all have been answered including different discussions which might have been carried out. There is a chance that some discussion might have ended mid way or you might have not answered some question to the full extent or the panel might have shared some problem statement. This is the time to grab the opportunity and take any one of the question or discussion forward. You can have a pre – defined list of questions ready. Based on how your interview turned out to be you can select a question to ask from the interviewer. 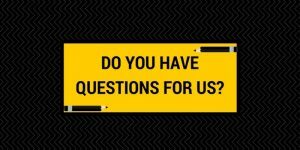 Your question list can have questions ranging from company’s culture to company’s next 5 year plans. It’s good to ask a question which helps you in initiating a quick discussion and build up a rapport with the interviewing team. Whatever you are asking should be dependent on the mood of the interviewer or the overall tempo of the interview session. You should not ask an alarming question which might take away interviewer’s ease of talking or lead to a point during discussion where you might start feeling uncomfortable. Next story Interview Question – Why would you like to join our company?